Nothing like a rainy day to make you crave the simple things in life ...like Vanilla. It feels like forever since I've had plain vanilla. no mixins, no nothing. Just vanilla. Wait, is "French" vanilla still considered plain?yeah sure, why not? 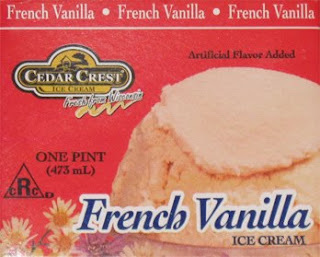 And here's what I tried today: Cedar Crest French Vanilla Ice Cream " fresh from Wisconsin ". It's pretty good. It's quite smooth and vaguely reminds me of a nice vanilla pudding. I don't need to bite into it like I did with the Schoep's the other day. On Second Scoop: It's vanilla, I don't know what else to say. It's fairly well made, it's a respectable vanilla flavor, but, well, it's vanilla. I don't know how many different ways to describe it.